Publisher's Summary: New from Andrea Cremer, the New York Times bestselling author of the Nightshade novels, comes an action-packed alternate-history steampunk adventure. My Take: Yes! I’m so excited that Andrea Cremer has created another trilogy that I’m going to love to death! 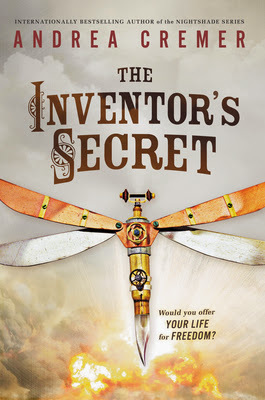 I’m a huge fan of her Nightshade series and I’m completely sold by The Inventor’s Secret! One of my favorite things about this book is how phenomenally detailed Andrea was in creating the setting for this book! I keep telling people that I would be thrilled if this book were made into a movie, and I think the movie would be amazing! She created and described the steampunk gadgets and machines so amazingly that, in my mind, the world she created is almost magical! I feel like it’s similar to how I would picture things from a Middle-Grade book, only we get some YA romance and some pretty vivid moments of … how do I say … well, I’ll just be blunt … there’s some killing. There are quite a number of difficult challenges the characters need to face throughout the book and right after they cross one stumbling block there always is another! It was so good!!! I just loved Charlotte’s character! She is so openly blunt about things and she’s so not the girly-girl type, but she’s thrown into playing the part of a girly-girl and it’s hilarious! She can’t hold her tongue and I loved it! I feel like she’s a lot like me, she is very opinionated, bossy (except I'm not bossy LOL) and very vocal about her thoughts and it’s extremely entertaining! Very rarely does she hold back, but if she ever does it always seems like things turn out good for her anyways. The ending was extremely sucky but in a really good way, and I’m going to be dying for who-knows-how-long before book 2 comes out! Ooh, so glad you liked this. I'll have to try to read it this summer. Thanks! I always like the blunt kinda characters and Charlotte sounds like a good one too. I'm glad that you enjoyed this one. I keep checking my library for it, hopefully soon. Great review. I couldn't put this book down! The world and the characters stick with you. I hated the way it left me hanging when it ended, but it was a great ending for setting up the next book in which I can't wait to read. I have to know what happened to the catacombs and if Charlotte will ever forgive Jack. I really hope she does! This is really great for Sci-Fi fans who want a break from the repetitive "Hunger Games" and "Divergent" style stories. A little predictable for older readers, but the writing is great and the alternate-history steampunk world is fun and interesting. I'm an English teacher, and I will definitely be adding this to my class library.